The difference here is about whose computer is running most of the programs — yours or your bank’s. A browser-based RDC system, as the name implies, is one in which you use a web browser to log in to the bank’s remote deposit service, and then begin scanning checks. Most of the software, except for a barebones package containing a few items like the scanner drivers themselves, runs on the bank’s servers. Welcome to the cloud. A software-based, or “client,” remote deposit system is a program that is installed and runs on your computer, and communicates with your bank when needed via a secure connection that is launched from within the program. 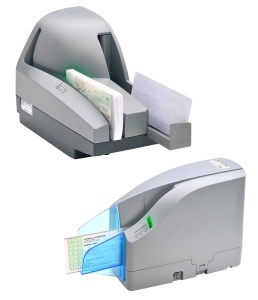 It is typically a good option for scanning large numbers of checks at once, or when your RDC system needs to interact with other programs on your computer. Most banks have moved away from client-based to cloud based applications due to the efficiency of keeping the software up to date managing the overall application. Using a smartphone camera instead of a PC and scanner to capture the check image. Major advantages include the convenience and cost (tends to be cheap or free). Significant drawbacks are the effort involved to capture a useable image, as well as a tendency for banks to impose low item and dollar-amount limits. Some banks and other companies have developed versions of remote deposit that interact with other financial/bookkeeping software such as QuickBooks or NetSuite. Some are also designed to work with various business or practice management software. Many remote deposit programs include the ability to create data files in common formats that are easily imported by other programs and databases. Is there a limit on the dollar amount of checks that I can deposit (either per individual check or per day)? What is the cutoff time for depositing items the same day? Are copies of the scanned check archived on my machine, or only with the bank? How long does the bank keep them available online? Is any kind of endorsing, franking, or virtual endorsement required?